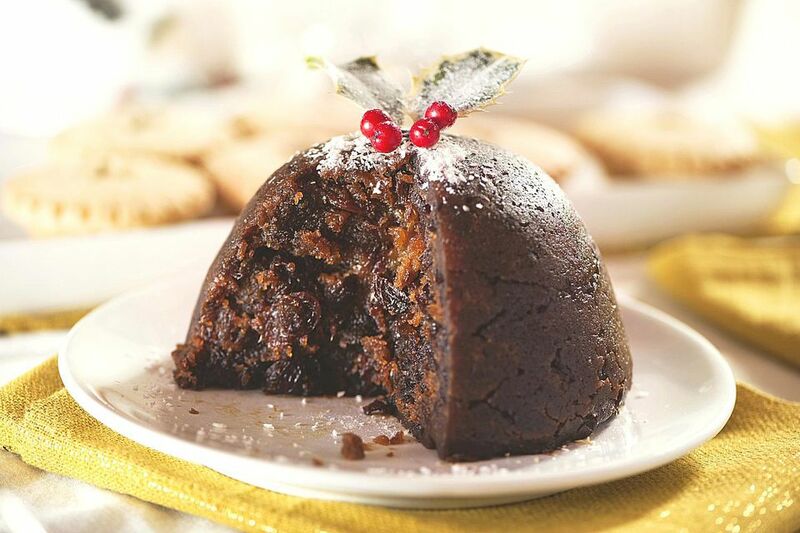 Christmas pudding plays such a large part in the traditional Christmas dinner. This cranberry, almond, and orange Christmas pudding is a slightly lighter version than the original, yet it's filled with flavor just the same. Christmas pudding is best made well in advance to allow it to mature which traditionally is made on Stir it up Sunday, the Sunday before Advent around the end of November. There may be a large number of ingredients in this recipe, which seems a little daunting, but simply assemble all your ingredients in advance. The rest is easy. Lightly grease a 1.4 L/17 cm pudding basin. Place the dried fruits and candied peel into a large bowl. Add the amaretto and stir well. Cover the bowl and leave to soak for a few hours, overnight if you can. Ina another large bowl, stir together the flour, mixed spice, and cinnamon. Add in the suet, sugar, breadcrumbs, and almonds. Stir again until all the ingredients are well mixed. Add the Cointreau, then finally add the marinaded fruits and stir again. Beat the eggs lightly with a fork in a small bowl. Add the eggs to the dry ingredients and the fruits and stir well. The mixture should have a loose consistency, if it is too dry, add a little milk to soften. Spoon the mixture in to the pudding basin, gently pressing the mixture down with the back of a spoon to make sure there are no gaps or air pockets. Cover the basin with a double layer of greaseproof paper or baking parchment, then cover with a layer of aluminum foil. Tie the paper and foil onto the basin with string. This will ensure the steam doesn't get into the pudding. Place the pudding into a steamer and set over a large saucepan of simmering water and steam the pudding for 7 hours. Make sure you check the water level often to make sure it never dries out. The pudding is cooked when it is slightly risen in the paper and solid when gently pressed. The pudding is not a light cake but instead is a dark, sticky, and dense sponge. Remove the pudding from the steamer and leave to cool completely. Remove the paper, prick the pudding with a skewer, and pour in a little extra amaretto. Cover with fresh greaseproof paper and retie with string. Store in a cool dry place until Christmas day. Serve with a brandy or rum sauce, brandy butter or custard. The pudding shouldn't be eaten immediately. It really does need to be stored and rested then reheated on Christmas Day. Eating the pudding immediately after cooking will cause it to collapse and the flavors will not have had time to mature. Left over Christmas pudding can be reheated by wrapping tightly in aluminum foil and heating through in a hot oven.